Heat a large non stick skillet over medium heat while you are getting the pancake batter prepared. In a small bowl combine together the protein powder, egg, baking powder, almond milk and stevia. If you want to add in the blueberries now, you can. Or you can put them on top once the pancakes are cooked. Mix well and pour your batter onto the heated skillet. Cook until the batter bubbles, and then flip to the other side. Repeat and enjoy! This easy protein pancake recipe yields a small amount 1-2 pancakes depending on how large you make them. It would count as 1.5 servings of protein for your daily allotment. I added extra milk into the batter and excluded the blueberries, the pancakes were very yummy. I used the VEGA Protein and Greens vanilla powder following the recipe exactly. Whipped with a whisk very well which may help them from getting runny. They were very good, I feel full and the syrup from the PS1000 recipes was easy and good! I tried making this twice and both times the pancakes came out to runny. The second time I tried to use less almond milk and a little bit of cottage cheese. I would agree they are more like crepes. ps.. Can hardly wait to eat my other pancake! I don’t know, I’m not a fan. I used quest vanilla protein powder and mixed the blueberries in. I only used a little splash of almond milk but it still seemed way too runny, and my pancakes came out more like a sweet omelette. VERY eggy and chewy. I might try it again, but I would probably double the protein powder and baking powder to compensate for the egginess. I’d also add some vanilla and skip the stevia. These didn’t work for us- we followed the instructions but they turned out more like crepes than pancakes and neither my husband nor I liked the texture or taste. The syrup is not apart of this recipe. 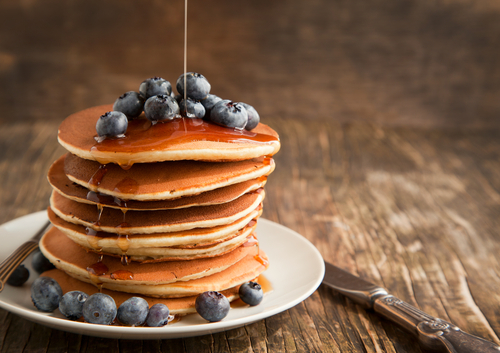 What is the syrup that is shown in the picture? This recipie is delicious, the only thing that wasn’t in the ingredients is a liquid. I just added a bit of unsweetened almond milk and that made a huge difference. It added sweetness and the pancakes came out nice and fluffy! My family loved them too!